In this review, we overview the pathophysiology of primary open-angle glaucoma as it relates to the trabecular meshwork (TM), exploring modes of TM dysfunction and regeneration via stem cell therapies. 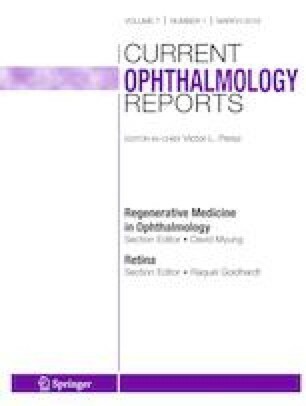 Stem cells from a variety of sources, including trabecular meshwork, mesenchymal, adipose, and induced pluripotent stem cells, have shown the potential to differentiate into TM cells in vitro or in vivo and to regenerate the TM in vivo, lowering intraocular pressure (IOP) and reducing glaucomatous retinal ganglion cell damage. Stem cell therapies for TM regeneration provide a robust and promising suite of treatments for eventual lowering of IOP and prevention of glaucomatous vision loss in humans in the future. Further investigation into stem cell homing mechanisms and the safety of introducing these cells into human anterior chamber, for instance, are required before clinical applications in treating glaucoma patients. This work was supported by NIH grants EY025643 (Y.D.) and P30-EY008098; Eye and Ear Foundation (Pittsburgh, PA); Research to Prevent Blindness; University of Pittsburgh Summer Premedical Academic Enrichment Program (SPAEP) (A.C.). Alexander Castro declares that he has no conflicts of interest. University of Pittsburgh owns a patent “trabecular meshwork stem cells” with Yiqin Du as one of the inventors. Zhou R, Caspi RR. Ocular immune privilege. F1000 Biol Rep 2010;2. https://doi.org/10.3410/B2-3. Vizoso FJ, Eiro N, Cid S, Schneider J, Perez-Fernandez R. Mesenchymal stem cell secretome: toward cell-free therapeutic strategies in regenerative medicine. Int J Mol Sci. 2017;18(9). https://doi.org/10.3390/ijms18091852.